In the context of the Urban Travel Plan adopted in 2001, Sibra and the Grand Annecy mobilised their resources in order to facilitate the use of public transport by people with a travel handicap: persons in wheelchairs, using crutches, pushchairs, having impaired vision. All the vehicles have a lowered floor and are fitted with a space reserved for wheelchairs. This line is accessible to persons with a mobility handicap and to wheelchairs. All the vehicles have a lowered floor with a space reserved for wheelchairs and a retractable access ramp. They also "kneel" for easier access. This line is fully accessible to persons with a mobility handicap and to wheelchairs. 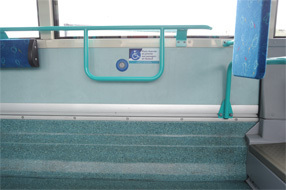 In compliance with the Disability Act, the most recent articulated vehicles are fitted with a sound system announcing the destination of the line and the different stops. In 2004 the creation of Handibus completed this high level of equipment and provided a more personalised service to users of wheelchairs. How is the equipment for people with a mobility handicap used? Place the wheelchair with its back to the support, facing the rear of the bus. Request the bus to stop using the button located close to this area under the windows to increase the vigilance of the driver when the wheelchair is getting off the bus. The retractable access ramp, located at the middle door, is reserved for wheelchair users. 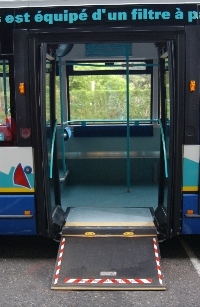 The ramp is deployed when the gap between the pavement and the floor of the bus is too wide. Its operation requires the doors to be closed and, therefore, a little patience.